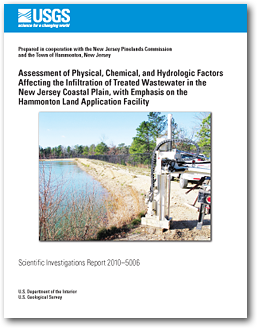 A hydrogeologic and water-quality investigation of the Hammonton Land Application Facility (Hammonton LAF) in Hammonton, New Jersey, was conducted to determine the factors that impede the infiltration of treated wastewater and to assess the potential for similar conditions to exist elsewhere in the Coastal Plain of New Jersey (particularly within the Pinelands National Reserve). Gamma logs, sediment cores, and hydraulic-profile testing indicate that extensive fine-grained strata and iron-cemented sands underlying the Hammonton LAF may impede infiltration and lead to the perching of diluted treated wastewater. Perched water was observed in augured holes adjacent to infiltration trenches, and analysis of wastewater loading and infiltration data indicates that infiltration trenches may receive lateral flow from multiple perched-water sources. Analysis of water-quality properties characteristic of treated wastewater show that although infiltrated wastewater is reaching the underlying aquifer, lengthy holding times and a long recharge pathway greatly reduce the concentrations of nitrate, boron, and many organic compounds typical of wastewater. Conditions at two currently operating facilities and one potential future facility in the New Jersey Coastal Plain were compared to those at the Hammonton Land Application Facility (LAF). Facilities operating as designed are not underlain by the restrictive strata that exist at the Hammonton LAF. Careful characterization of the geology and hydrology of the unsaturated zone underlying infiltration structures of future facilities in the New Jersey Coastal Plain and similar hydrogeologic settings will help to avoid constructing infiltration structures over or within low-hydraulic-conductivity strata that will decrease infiltration rates. Reilly, T.J., Romanok, K.M., Tessler, S., and Fischer, J.M., 2010, Assessment of physical, chemical, and hydrologic factors affecting the infiltration of treated wastewater in the New Jersey Coastal Plain, with emphasis on the Hammonton Land Application Facility: U.S. Geological Survey Scientific Investigations Report 2010–5006, 59 p.
Appendix 1. Field parameters, nutrients, major ions, and trace elements in samples collected at the Hammonton Waste Water Treatment Plant and Land Application Facility, southern New Jersey, December 2006–May 2007. Appendix 2. Wastewater indicator compounds measured in samples collected at the Hammonton Waste Water Treatment Plant and Land Application Facility, southern New Jersey, December 2006–May 2007. Appendix 3. Results of blind-sample analyses for selected parameters by the U.S. Geological Survey, Branch of Quality Systems, November 2006—June 2007. Appendix 4. Lithologic description of continuous sediment cores, Hammonton Land Application Facility (LAF), southern New Jersey.